With all this weird weather we’ve been experiencing in the past few weeks, we’ve been triggered to do as much as possible to secure our homes, cars and our valuables. Images of all the damage incurred by motorists have gone viral, but we can’t push aside property damage – more so now that we have random tornados lurking about! After the tough, dry years of El Nino, we’re now faced with the stormy cousin, La Niña, and she comes bearing heavy rainfall. If these predictions play out accurately, you don’t want to find yourself in a position of damage that you could have prevented. 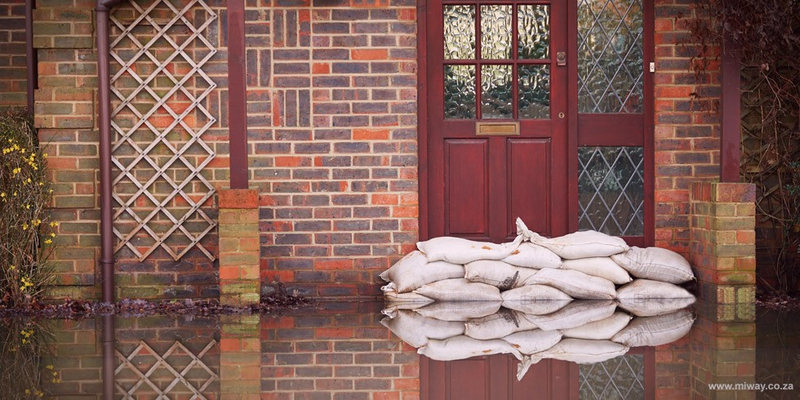 Fortunately for us, there is something we can do to protect our homes, household contents, business properties and vehicles from possible flood damage. Know your risk! When shopping for a house, one of the important things to enquire about would be whether or not the area is a known flood area. If you aren’t certain about your current area, find out ASAP. Find the problem areas. Identify areas within or around your property that could pool and flood your home. Once these have been identified, you can put the right flood-damage preventative measures into place. Keep it clean. If you have any storm water infrastructure on your property or the road around you, it would be wise to check these regularly and make sure that they are clean of any debris that could prevent them from serving their purpose. Contact the municipality if you find that the municipal storm water drains near your home are blocked. From the gutters to the rooftops… Regular checks will ensure that your gutters and drain pipes are all clear and ready to report for duty when the rains fall. Clean these out, together with the drain entrances and other water-related apparatus that drain water away from areas where it may pool. Check your roof to identify any possible leak spots before it’s too late. Seal up any points with water resistant material so that they don’t end up as leaks when the storms hit. If you can, build a protective wall to stop water from reaching sensitive belongings such as electrical equipment etc. Relocate… not yourself but rather your belongings. Make sure that your sensitive equipment is as high up from the ground as functionally possible. When floods hit, the highest point is the safest point. Anchor what you can. Where possible, provide anchorage for any items that could become floating debris when hit by fast flowing water. Creating a form of resistance doesn’t only prevent stuff from floating away going missing, it also ensures that they don’t cause further damage to other structures as they float away. With all this said and done, it would be a wise move to sign up for warning notifications from the SA Weather Bureau. As a MiWay client, this early warning service is already available to you - #InsuranceFreedom that gives you a heads up so you can move your possesions out of the way of danger.